“Knights of the Eternal Throne” is a remarkable single-player adventure and one of the best “Star Wars” stories in years. It’s certainly the strongest narrative content Bioware’s “Star Wars: The Old Republic” MMO has received since its launch in 2011, anyway. Storytelling and gameplay are leaps and bounds beyond last year’s awful “Knights of the Fallen Empire” expansion. Here, the plot is both original yet suitably faithful to “Star Wars” lore, your dialogue decisions can drastically impact the plot, and things conclude in satisfying fashion. If that’s enough for you, “KOTET” is great. It’s a gripping nine or 10 hours and well worth the $15 price tag. This is probably as close as we’re going to get to a third “Knights of the Old Republic” game and really feels like the intended finale to the overarching story the “Old Republic” games have been telling for over a decade now. But past that first month, that few hours of solo adventuring content, there’s absolutely no reason for longtime or returning players to dedicate further time and money to the game. “KOTET” is a worthwhile solo adventure, but a horrific MMO. It’d be one thing if the issue was a lack of real endgame content — though the expansion has absolutely none to speak of — but the greater problem lies in the abhorrent gearing system and Bioware’s apparent aversion to quality assurance, free-to-play users and overall accessibility. Before we dive into that, let’s talk positives. For all of its spectacular failings as a multiplayer game, “KOTET” still has an enjoyable story. Subscribing for one month unlocks the expansion and all prior content, and the cost is justified even if your only new experience will be the “KOTET” story arc. The plot wastes little time before throwing your character into the action. Empress Vailyn is back, she’s grown increasingly insane and she wants you, her brother Arcann and mom Senya dead. That’s all made clear in the first five minutes, then you’re thrown into a massive invasion on the planet Voss. Good luck! Yes, it’s the same basic MMO combat and there are still way too many Skytroopers and Zakuul Knights, but presentation goes a heck of a long way. When fighting would otherwise be stale, interesting locales and a drive to get to the next cutscene are apt motivators. There are even a few sections where you control different characters, ranging from a mouse droid to an AT-ST-esque walker. It still doesn’t make much sense if your character isn’t a Force user, but hey, that’s a price of sharing a single narrative between the eight origin classes and their unique backgrounds. Regardless, it’s particularly refreshing to visit old locales with new looks, such as the recently war-ravaged Voss. It’s certainly a nice change from grinding the same old daily quests on prior planets, which was a major focus of the prior expansion that made zero narrative sense. The new areas are also enjoyable; a desolate planet crucial to “Old Republic” lore finally makes its haunting debut and is one of the most memorable planets added to the game since launch. Major characters from the Republic and Sith Empire make appearances, which helps connect “KOTET” more closely to the game’s overall lore. The core of the story revolves around your character’s fight against Valkorian’s family and it’s suitably dark and engaging. Though an arc revolving around the ever-manipulative SCORPIO droid drags on for a bit too long and smacks of filler, the rest of the story is a succinct, solid success. OK, negatives. I won’t sugarcoat this: “SWTOR” has carried on despite some a myriad of bugs, exploits performance issues, laughably greedy microtransactions and otherwise terrible design decisions. None of that has changed here. “KOTET” is essentially three things: The new story, Uprisings and a complete overhaul of the gearing system. Story is good. Check. Uprisings: They’re basically miniature Flashpoints (the game’s version of instanced dungeons) and are basically fine, but a far cry from real endgame content. There’s five of them and more are on the way, but they’re far too simple and short to offer much replay value. Those two things are the entirety of new content. No operations (raids), warzones (battlegrounds), arenas, daily questing areas or multiplayer planets, server-wide events or Galactic Starfighter space PvP content. Nothing. As “KOTET” is unlocked simply by being a subscriber, it’d be unfair to compare it to a full expansion such as “World of WarCraft: Legion.” But still, the absolute lack of anything new to do after the story is over is stunning, particularly since this was the case with last year’s expansion, sans two widely-hated PvP maps added later in that expansion’s lifecycle. The lack of content begs the question of why one would even bother to gear their characters. The new progression system certainly doesn’t help; it’s so unbelievably bad, it’s as if Bioware is openly hostile to the mere concept of endgame content. Gear is doled out of RNG boxes which are acquired by completing most in-game activities. Randomized loot is terrible, but being forced to “pay-to-win” is even worse. “KOTET” offers microtransactions to boost the rate at which you receive gear. This would pass for a mobile tower defense game, but this is a major MMO, and simply isn’t acceptable. The progression system and the loot you receive is tied to your role and class, which means that gearing multiple characters is an unbelievably time-consuming and luck-driven hassle. Given the continued drought of new content, playing multiple characters is one of the few ways to keep veteran players engaged. 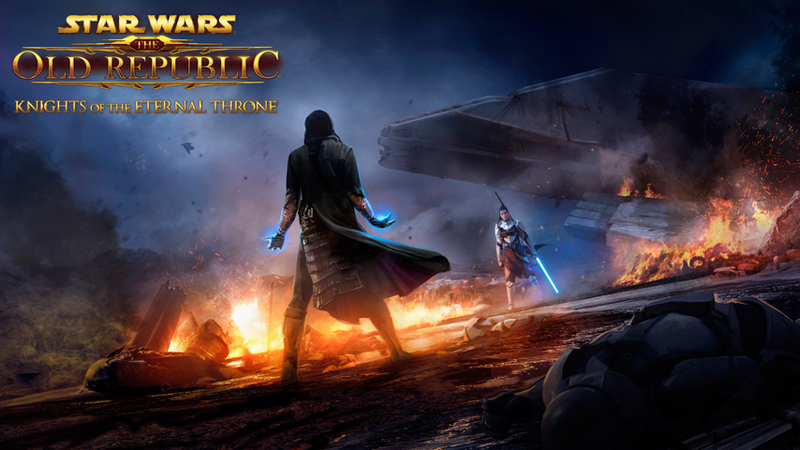 “SWTOR” has strongly encouraged creating numerous alts since its inception, and the complete reversal in philosophy is stunning. As for balance, well, players have argued about that since launch and will continue to do so until the game’s death knell. What matters more is the removal or changes to certain iconic or situationally useful abilities. Ability pruning is common in MMOs, but the execution here is remarkably sloppy. My Sith Assassin lost Force Lightning, among several other abilities. Besides the sheer iconic value of the ability, the move had limited usefulness when my character would be rooted out of melee range. So on, so fourth for other classes such as Sniper and Powertechs that also lost major abilities. Menus have disappearing assets, several abilities are broken or overtuned to the point that it breaks the game and even the new missions have several bugs, some of which require resets and can waste over an hour of progress. Yes, this is an MMO and glitches are to be expected, but given the overall lack of content to bugtest and the several months of closed beta testing, the amount of issues and their severity are inexcusable. Will these things be remedied and new content added in future patches? It’s obviously impossible to say with certainty, but if the past is any indication, that would be a strict no. Bioware has been promising new group content, bug fixes and a myriad of other longstanding requests for years and has consistently failed to deliver. Loyalty among even the most devout players is at an all-time low and that isn’t looking to change. Already, several servers are virtual ghost towns. Just a week after launch, servers such as Prophecy of the Five and The Bastion have single-digit populations in major hub areas. That’s a really, really bad sign. So, should you buy “KOTET?” If you’re looking for an interactive “Star Wars” story and want to experience the conclusion of the “Old Republic” storyline, $15 is a small price to pay. It’ll be fun, for a time. But if you’re here hoping that the expansion is a “SWTOR” revival that will reestablish the game as a serious MMO, just stick to “World of WarCraft.” Or literally any other major game in the genre.